A team led by City University London's Mixed Reality Lab and other university academics are finalists in the HackingBullipedia Global Challenge, aimed at discovering the most inventive design and technology to support the world's largest repository of culinary knowledge. A combined team comprising academics from City University London's Mixed Reality Lab, University of Aix-Marseille (France) and Sogang University (South Korea) has made the final of this year's HackingBullipedia Global Challenge aimed at discovering the most inventive design and technology to support the world's largest repository of culinary knowledge. 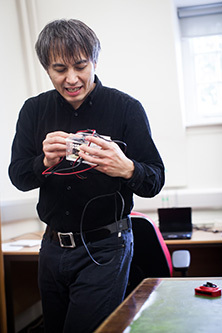 Led by Professor Adrian Cheok, Professor of Pervasive Computing in the School of Informatics, their competition entry is titled "Digital Olfaction and Gustation: A Novel Input and Output Method for Bullipedia". The team proposes novel methods of digital olfaction and gustation as input and output for internet interaction, specifically for creating and experiencing the digital representation of food, cooking and recipes on the Bullipedia. Other team members include Jordan Tewell, Olivier Oullier and Yongsoon Choi. No stranger to digital olfaction applications in the culinary space, Professor Cheok recently gave a Digital Taste and Smell presentation to the third top chef in the world, Chef Andoni Luiz Aduriz, at Mugaritz restaurant in San Sebastian, Spain. The HackingBullipedia Global Challenge was created by the renowned world leading culinary expert, Chef Ferran Adria I Acosta. The jury, comprising some of the best culinary and digital technology experts in the world arrived at a shortlist of four teams after carefully sifting through 30 proposals from three continents drawn from a mix of independent and university teams. The other teams in the final are from Universitat Pompeu Fabra (Barcelona); the Technical University of Catalonia; and an independent (non university) team from Madrid. On the 27th of November, two representatives from each of the four finalist teams will pitch their proposal and give a demonstration to the competition's judges after which the winner will be decided. "I am quite delighted that we were able to make the final of this very challenging and prestigious competition. There were entries from various parts of the world covering a broad spectrum of expertise including a multidisciplinary field of scientists, chefs, designers, culinary professionals, data visualisation experts and artists. We are confident that our team has prepared an equally challenging and creative proposal which will be a game changer in the gastronomic arena."